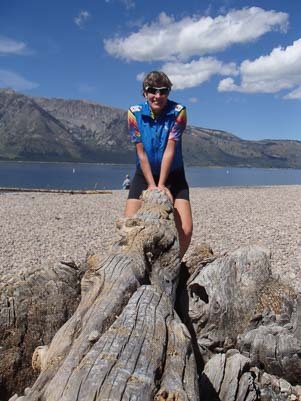 Grand Teton National Park – 101 Ways to Enjoy The Tetons! 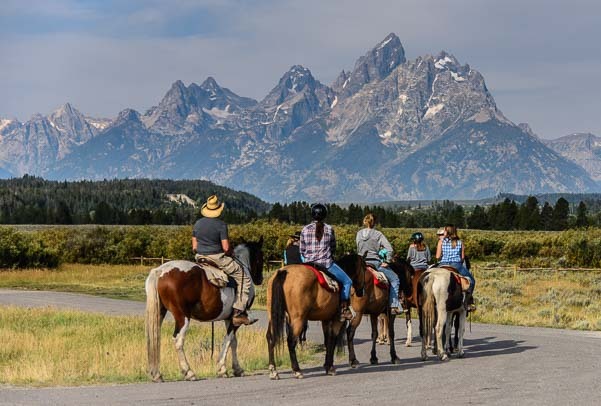 What a great way to see the Tetons — on horseback! September, 2014 – The National Park Service has posted some surprising statistics over the years about just how many hours the average visitor spends in each park. Crazy as it sounds, it is really common for folks to do a quick drive-by, hanging out the car window for some photos to take home, and then checking the park off their bucket list. 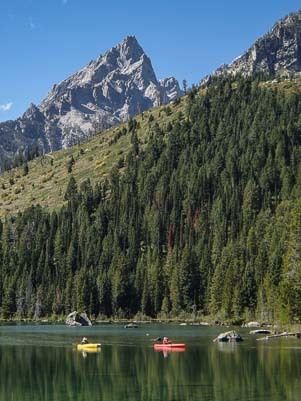 Grand Teton National Park often suffers that fate, largely because it is laid out on a north-south highway that runs from Yellowstone National Park to the town of Jackson, Wyoming. A new paved bike path goes nearly 20 miles along the base of the mountains. 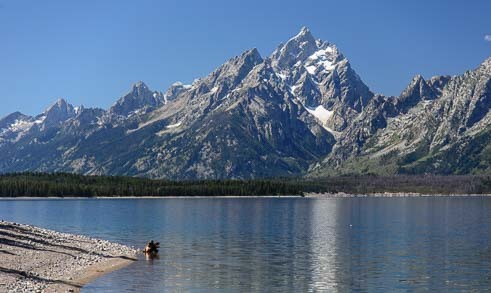 A USA Today article from July, 2012, stated that the average time spent in the Tetons is just 6.5 hours!! While it’s easy to drive through the Tetons really fast, during our two week stay on this visit we discovered there are all kinds of wonderful ways to get to know this park in a much more intimate way. 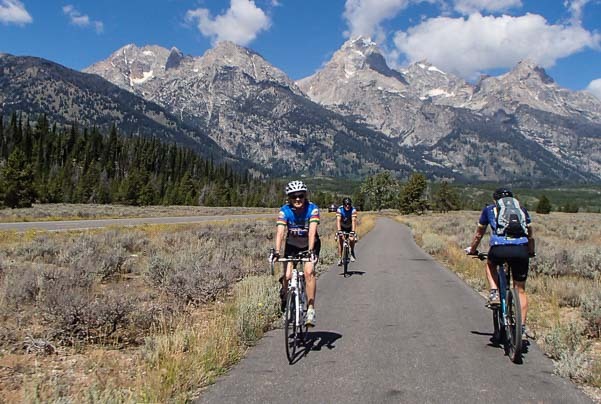 A fantastic addition to the park that was built since our last visit in 2007 is a nearly 20 mile long paved bike path that runs from the southern entrance of the park to the far north end of Jenny Lake. The only problem with riding by views like this is keeping your eyes on the road! We rode portions of it several times, and it took us to quite a few off-the-beaten-path locations within the park that we never would have stopped at if we’d been touring in our truck. Every mile of this path was filled with families and cyclists of all ages. They were all enjoying a day of riding in the fresh air, with a stunning view the whole way. We met cyclists from Jackson doing their daily workout ride (lucky them!! ), clubs from out of town that had arranged a group ride of the area, and the Backroads Adventure Tour company with paying customers. especially on the curvy roads. The roads throughout the park are ideal for scenic driving in a car, but they are probably a whole lot more fun on a motorcycle. 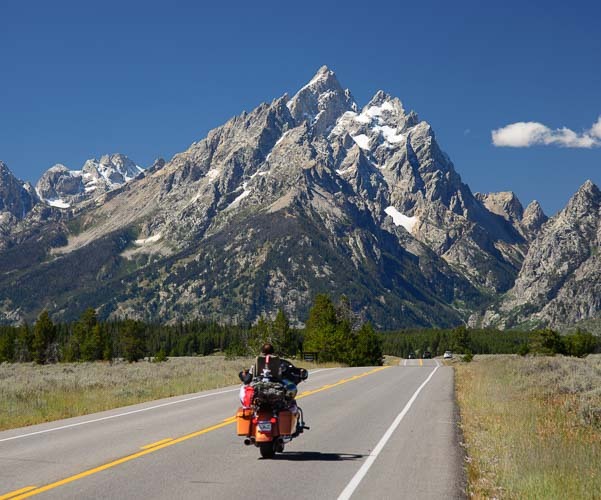 There’s a series of sweeping turns in the northern portion of Teton Park Road that are just too stunning for words, and doing them on a motorcycle would be quite a thrill! Boating is another great way to go. One day as we walked along the pebble beach at Jenny Lake, we rounded a point and our jaws dropped when we saw a beautiful sailboat anchored on crystal clear water set against a spectacular mountain backdrop. 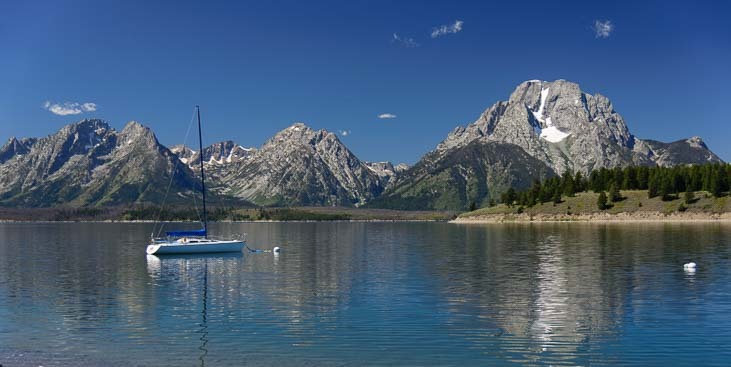 Ahhh… maybe the nicest way to experience the Tetons would be by sailboat. Kayaks and canoes are available for rent. At the south end of Jenny Lake a small boathouse is home to the ferry boats and rental kayaks and canoes. Getting out on the water is always a pleasure, especially in a watercraft you can power yourself. These two gals said they were loving their kayak ride as they floated past me. We saw lots of folks kayaking on the lake, some of whom had brought there own and some of whom were renting them from Jenny Lake Boating. 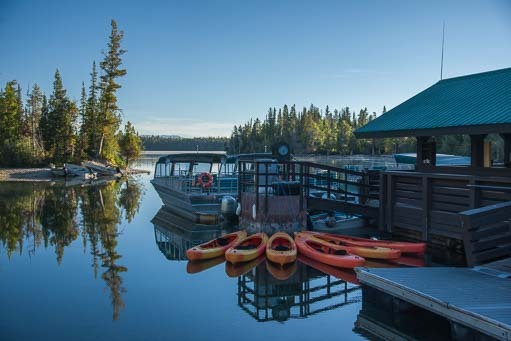 This company also rents canoes and offers ferry boat rides and scenic boat rides on Jenny lake. A quickie ferry boat ride gets you out on the water and across the lake. Even though we missed the summertime bargain boat fare for this ferry, I ended up scoring a free ride later that morning with some rock climbers who were headed across the lake for a day of climbing. Mark had already hiked halfway down the two mile trail that goes from the boathouse to the dock on the far side of the lake, so we chatted on our trusty two-way radios about my good luck and his scenic hike, and later caught up with each other! 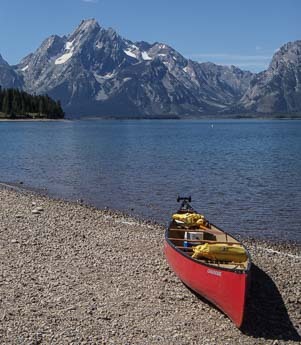 If flying across the lake at breakneck speed while hanging onto your hat with both hands isn’t the way you dream of way of seeing the Tetons from the water, a canoe trip is a much more peaceful way to go, and you can share the ride too! There are loads of rafting trips, from little rafts like this one to huge ones with 10 people aboard. We were astonished by the size of some of the powerboats. What a spot to keep a boat! River rafting trips are also extremely popular, and we saw several huge rafts filled with ten or so people. A guide stood up in the middle and used an enormous oar to steer the boat. Fishing is a nice quiet way to take in the serenity of the Tetons. There were powerboats of all shapes and sizes at the marina too. This is a place that will get your creative juices flowing! Of course, nothing says you have to be on some kind of moving vehicle to enjoy the Tetons. The more stationary pursuits of fishing and artwork are other great ways to soak in the beauty of this magical place. 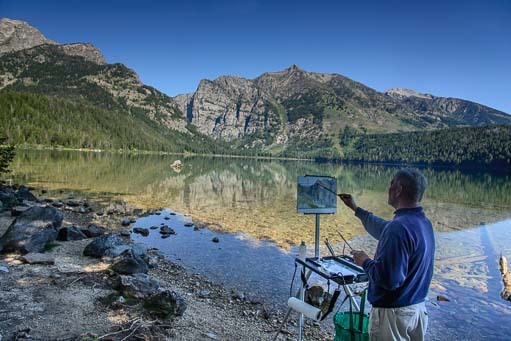 When we hiked to Phelps Lake, we were delighted to come across an artist working at an easel by the water’s edge. Aw heck, when you find a see-saw on the beach you’ve gotta try it out! Sometimes it’s fun just to be a kid in the presence of these special mountains. On the shores of Jenny Lake we found a huge driftwood log see-saw, and we promptly jumped on it to give each other a ride. 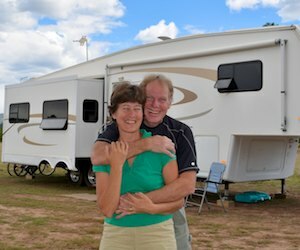 RVs are almost as common as cars in this park. 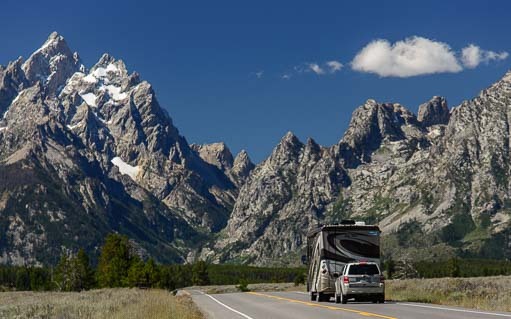 Of course, the Tetons are RV heaven, with lots of camping options both inside and outside the park. Every other vehicle on the road was an RV of some sort, and a good percentage of them were rental RVs. The Rockefellers built audio-visual (and audio-only) meditation rooms where you can experience nature without the dirt and dust. 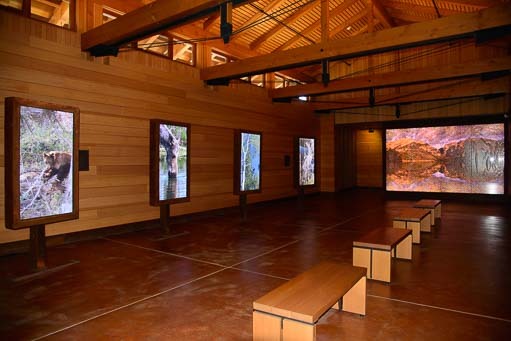 For those who don’t want to deal with the grit and effort of hiking and being outdoors, the Rockefeller family (who were responsible for the Park Service’s acquisition of most of the lands in the area), have created a unique “green” building that has several audio-visual meditation rooms. This might seem goofy, but watching the baby bears climbing trees, the moose lapping water from the lakes and the birds flitting between the trees in larger-than-life scale was actually really cool, especially since we didn’t see those things at close range on any of our hikes. What a place to relax and unwind for a while! Perhaps the best way to enjoy the Tetons, though, is just to pull up a chair and kick back in the presence of these magnificent mountains. After taking in the incredible views, it is even permissible to look away from the dramatic landscapes for a while and settle in with a book! 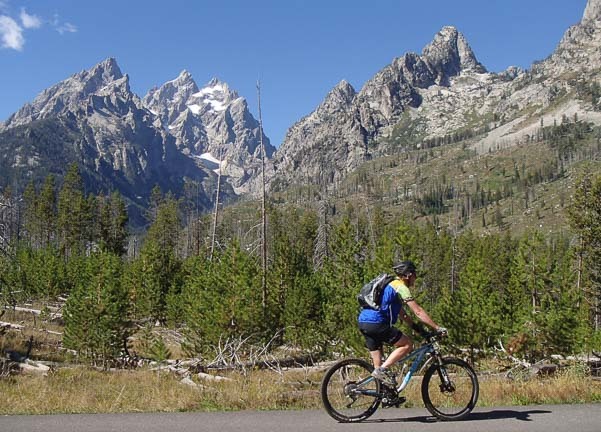 Well, that’s not exactly 101 ways to enjoy the Tetons, but it’s a whole bunch! Grand Teton Lodge Company is the National Park’s concessionaire for the campgrounds, (Colter Bay and Gros Ventre are RV campground options at different ends of the park). 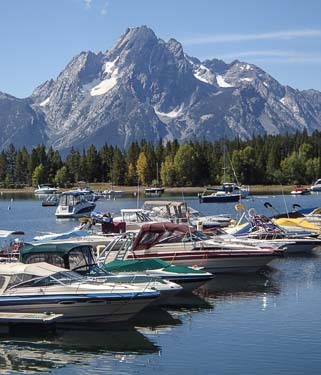 They also offer scenic lunch/dinner cruises on Jackson Lake and river rafting trips. 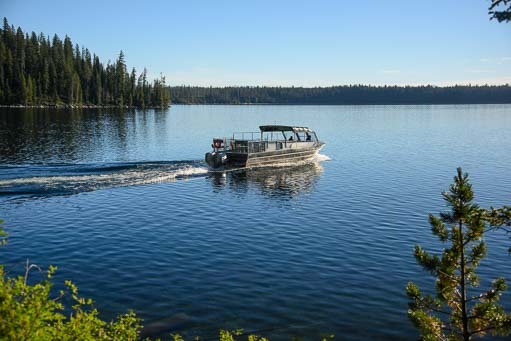 Jenny Lake Boating offers ferry rides, private boat rentals and kayak and canoe rentals on Jenny Lake.